Meet the intrepid souls who pushed Victorian technology to its limits and paved the way for our present age. The shimmering halo of Victorian technology lures us with the stuff of dreams, of nostalgia, of alternate pasts and futures that entice with the suave of James Bond and the savvy of Sherlock Holmes. But the true science and tech reveals a much wilder reality of machines and humans, stunning innovations and uncertain consequences. Once, we sought to control power. In this latest age, humans have learned to manufacture power. We’ve become so used to flipping a light switch that we rarely take a moment to think—really think—about what this meant in our history. But to late Victorians, and particularly late Victorian engineers, this was the stuff of dreams. And maybe of nightmares, too. A social history of technology and the seduction of “clockwork futures”: this is the story of hope, trepidation, and the struggle of modern science in a steam-powered age. Salesmanship and indeed showmanship is the very spirit of steampunk, and the fictions we tell ourselves are part of the scientific framework we have inherited, part of how we “do” science and how we understand its destiny—yesterday, today, and tomorrow. Zeppelins and steam-trains; arc-lights and magnetic rays: these fascinating (and sometimes doomed) inventions bounded from the tireless minds of unlikely heroes. Such men and women served no secret societies and fought no super-villains, but they did build engines, craft automatons, and engineer a future they hoped would run like clockwork. Along the way, however, these same inventors ushered in a contest between desire and dread. From Newton to Tesla, from candle and clockwork to the age of electricity and manufactured power, technology teetered between the bright dials of fantastic futures and the dark alleyways of industrial catastrophe. 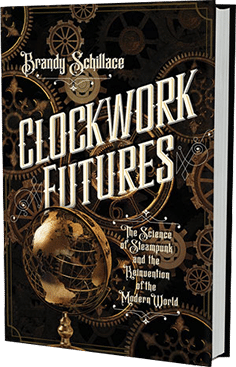 In the mesmerizing Clockwork Futures, Brandy Schillace reveals the science behind steampunk, which is every bit as extraordinary as what we might find in the work of Jules Verne, and sometimes, just as fearful. These stories spring from the scientific framework we have inherited. They shed light on how we pursue science, and how we grapple with our destiny—yesterday, today, and tomorrow.